The organization where I work recently moved to a new office space in a more crowded location and our users started complaining about wifi connectivity issues a lot. Their connection would become unresponsive at times, with ocasional timeouts. We didn’t change anything in our WIFI setup from our previous office, and we didn’t have that problem in our old place, so this was new to us. our wifi setup consist of 3 Linksys WT 1900 routers spread out strategically around the office. By looking at all the wifi access points within our range in our office It became obvious to us that the problem was probably frequency congestion. We had tried to move our routers wifi channels to different frequencies to see if things got better, but no. 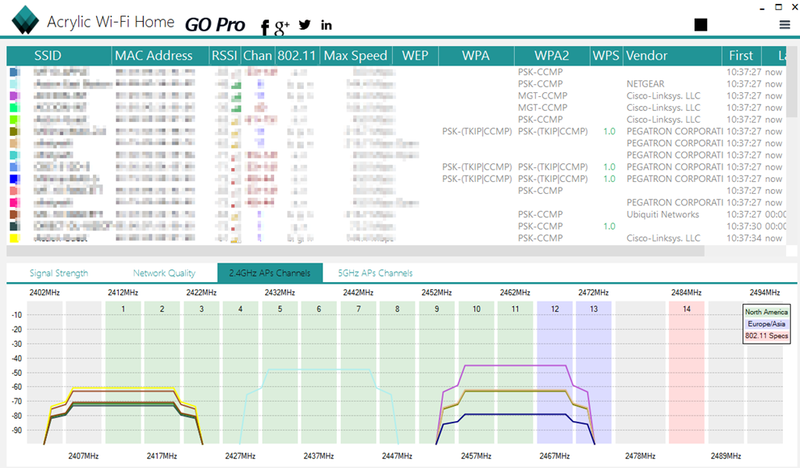 One critical detail we noticed is that most of the people complaining about the wireless connection were people using older laptops with the 2.4GHz wifi band. When we knew the problem was being caused by frequency congestion in the 2.4GHz band we needed to come up with the solution. The first thing we needed to do was to make sure the routers were set to use only one of these channels 1,6 or 11. these are the only channels that don’t overlap in the 2.4GHz band. Using the wifi scanner I mentioned above, I was able to see which channel was the least congested around us , and set the routers to use that channel. If you see a wireless router within your range broadcasting in any other channel than 1,6 and 11, you should probably talk to the owner of that router and make them change it. It will be better for you and for them. Changing the frequency channel will definitely improve the wireless connection, but you still might have a lot of interference when having many devices connected to the wifi, so you need to tweak the routers as well. The Linksys WT 1900 wifi routers we are using are not enterprise so features like download throttling etc are missing. I decided to use the OpenWRT ROM instead . After installing the OpenWRT ROM, I was able to throttle downloads, etc, and schedule a cron job to automatically reboot the routers every week. After doing that the wifi connection in our office has been more stable. Once in awhile we notice the routers clogging up, but with a few tweaks here and there those issues have become more infrequent.